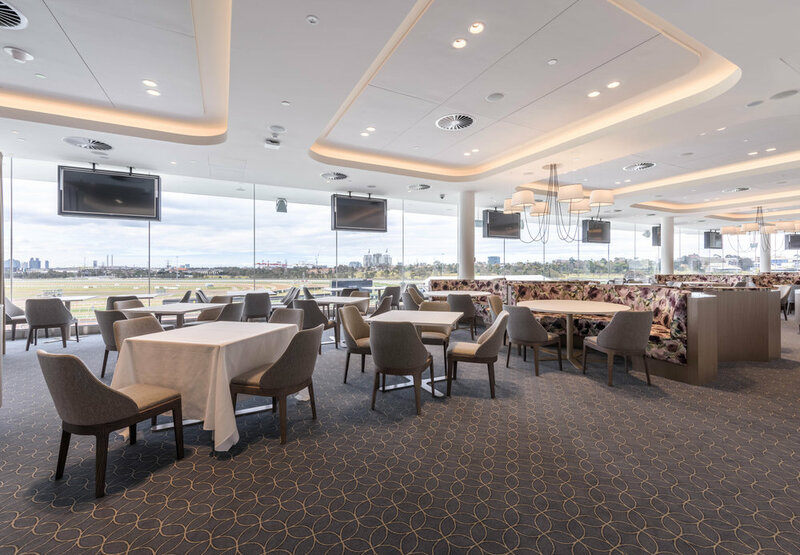 The Byerley is set to be the Club Stand’s premium dining experience. With a show kitchen, cellar display and a rotation of high profile guest chefs and sommeliers, the restaurant is on par with Melbourne’s finest dining establishments. The setting is light and spacious, the décor elegant and the palette fresh and pastel. Watercoloured floral banquettes and antique inspired chandeliers create elegant eyries from which to inhale the uninterrupted skyline vista. The carpet is a feminine, geometric pattern that appears like blooming petals. The linked circular pattern, alongside its stable neutral dusty blue and gold colour scheme, adds a contemporary influence to the lush, garden-party themed setting.